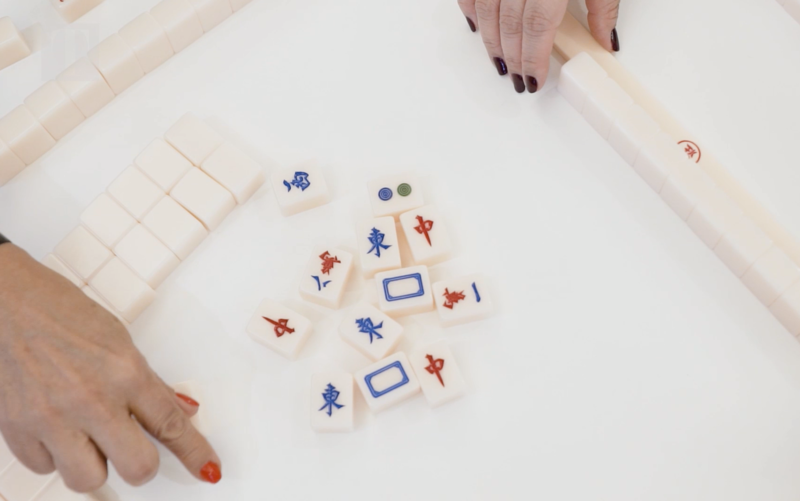 For centuries, Chinese people have been meeting around the mahjong table to gamble, gossip and get to know one another—in ways that you just can't by simply talking. The cacophonous tiled game from the Qing dynasty is often played at family gatherings such as Chinese New Year and weddings, requiring equal parts strategy and luck to come out on top. "When you play mahjong, the true character comes out," says Caroline Roberts, luxury fashion brand and marketing consultant. Caroline is the founder of the Elite Joy Luck Club, a social group of about 16 members that meet regularly for mahjong marathons (that being the appropriate word to describe the tournaments that often last up to eight hours). "We normally try to play at either the [Hong Kong] Country Club or at Tsui Hang Village in Central because we have a room there... or at home," she says. In fact, more and more Hong Kong restaurants are introducing mahjong rooms—many of them private—into their offerings, as the game is starting to become trendy again (perhaps due to that famous scene in Crazy Rich Asians). How I started playing mahjong: I started when I was quite young. I remember my mother was the one who always played at home, so after school, we’d watch her play. Sometimes during Chinese New Year, I would play with my cousins with my lai see money. Why I love mahjong: It’s a great game, and it takes a long time to finish one game, but I think it’s very exciting. It’s not only because of luck—your skills are very important, so it helps me get better every time. What kind of mahjong player I am: My teachers told me I’m a little bit reckless sometimes. I like to win so I take more chances, but I know I should be a bit more responsible so I am more cautious now. I don’t have to win every hand. My winning strategy: To win as much as you can no matter what the score is, just to get the momentum going. How I started playing mahjong: I have been playing since I was a very little kid. My entire family played mahjong at home, you know—cousins, uncles, aunties. Then when I was a kid, my father used to hold me while he was playing mahjong. He never really taught me how to do it, but I think when you are surrounded by such an environment, you tend to pick up a few things. Why I love mahjong: I consider mahjong my meditation because at work you are stressed out and with mahjong, you can just relax with your friends. What kind of mahjong player I am: In a game, you always want to win, but it’s not always what you want—meaning I win and I lose, and I keep a good relationship with my mahjong friends so they keep calling me. My winning strategy: Try not to lose as much in each game! And, sometimes, when somebody is having a very good hand, just let them win. But when you have a good one, you might as well take advantage of that and try to win as fast as possible. How I started playing mahjong: I started playing in 1995 after my studies from abroad. I learned how to play by watching my parents play—I never really had a real lesson. Why I love mahjong: It's a very interesting game—every single game is different and you really have to think about what to do with the cards to get the most out of it. To me, it has a lot to do with luck. What kind of mahjong player I am: I’m an honest player—I don’t lie, I don’t cheat. I mean everyone has the chance to win. If you’re lucky, no matter what, you won’t lose, so I enjoy playing because of this. My winning strategy: Never get angry! If you lose and you get angry, you lose even more. I mean, it's no big deal, it’s just a game. The best thing about mahjong is that you play with four people and you get to chit chat and laugh—that’s the most important part, to mingle. How I started playing mahjong: I’ve been playing mahjong for maybe 20 years or longer, and I love it! I don’t even remember who taught me. Why I love mahjong: Because it’s a mind game, you know? I always tell my friends, don’t tell me to go horse racing, there’s no strategy. But with mahjong, you have a strategy. You don’t call this card, you call the other card and you can change when you find that the card you are calling is dead, so that is strategy and it’s good for the mind. What kind of mahjong player I am: I’m very calm. I don’t play big—we don’t play big stakes so it’s okay, it’s no big deal. My winning strategy: If I know the card [I'm holding] is a losing card, I will hold it and take the long way around to call another card and hold back that card, knowing well that that card has a high chance of losing to one or three of the other players. You feel so good when someone is calling that card and it’s the card that you're holding.